Attach to a Dwarf hero. Action: Exhaust King Under the Mountain to look at the top 2 cards of your deck. Add 1 to your hand and discard the other. Attach to a hero. Limit 1 per hero. Response: After attached hero quests successfully, name a card type and discard the top card of your deck. If the discarded card is the named type, take it into your hand. Limit 1 per deck. Attach to a hero with Ranged. Response: After attached hero declares an attack, add Black Arrow to the victory display to give attached hero +5 Attack for this attack. When Bard the Bowman makes a ranged attack, the enemy he attacks gets -2 Defense until the end of the phase. When counting the number of Dwarf characters you control, Bombur counts as two. To me! O my kinsfolk! Action: If you control at least 1 Dwarf hero, put a Dwarf ally from your discard pile into play under your control. Put that ally on the bottom of your deck at the end of the phase. Attach to a hero with the printed Ranged keyword. Combat Action: Choose an enemy in the staging area. Exhaust Great Yew Bow and attached hero to make a ranged attack against that enemy. Declare attached hero as the attacker. No other attackers can be declared for this attack. Action: Exhaust a Weapon attachment to choose a non-unique enemy with 0 Defense. Discard the chosen enemy. Action: Exhaust a hero you control to shuffle the encounter deck and look at its top card. Place progress tokens on the current quest equal to the revealed card's Threat. Then, put that card back on top of the encounter deck. Action: Choose a character in play (other than Bilbo Baggins). Add Bilbo Baggins' total Willpower, Attack, and Defense to that character's Willpower, Attack, and Defense respectively until the end of the phase. Attach to Bilbo Baggins. Action: Exhaust Bilbo's Magic Ring and raise your threat by 1 to gain 1 Baggins resource. (Limit once per round.) 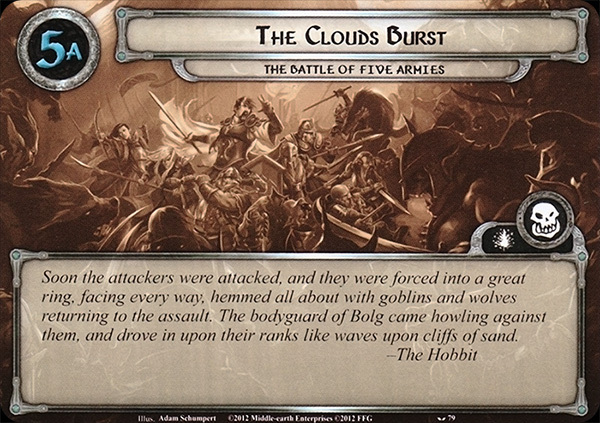 Response: After Bilbo Baggins exhausts to defend an attack, exhaust Bilbo's Magic Ring and raise your threat by 3 to cancel all damage from this attack. Attach to Bilbo Baggins. Attached hero gets +1 Defense and +1 hit point. Attach to a hero. Action: Exhaust The Arkenstone and raise your threat by X to lower by X the cost of the next ally you play this phase that matches the attached hero's sphere. Attach to a hero. Action: Add Thror's Golden Cup to the victory display to draw 3 cards. Attach to a hero. Attached hero gains Ranged. When making a ranged attack, attached hero gets +2 Attack. Attach to a hero. Attached hero gets +2 Attack. Response: After attached hero attacks and destroys an enemy, deal 1 damage to another enemy engaged with you. 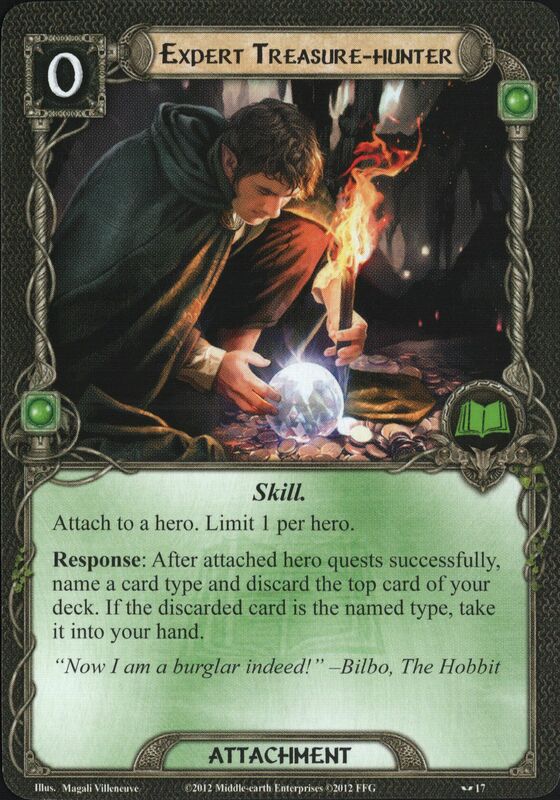 Bilbo Baggins does not count against the hero limit and cannot gain resources from non-treasure cards. 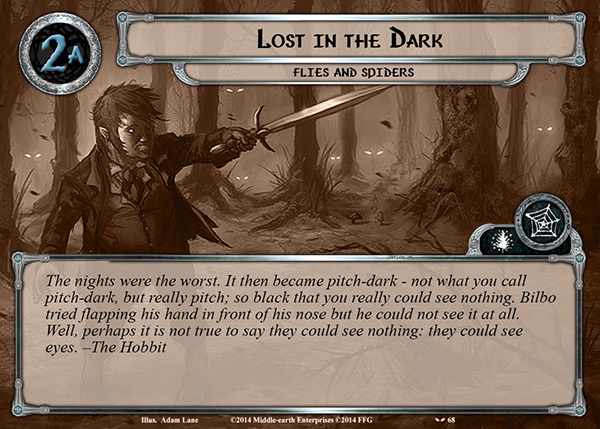 The first player gains control of Bilbo Baggins. Action: Spend 1 Baggins resource to search your deck for a treasure card and add it to your hand. If Bilbo Baggins leaves play, the players have lost the game. Setup: Each player may shuffle 1 copy Bilbo's Magic Ring into his deck. 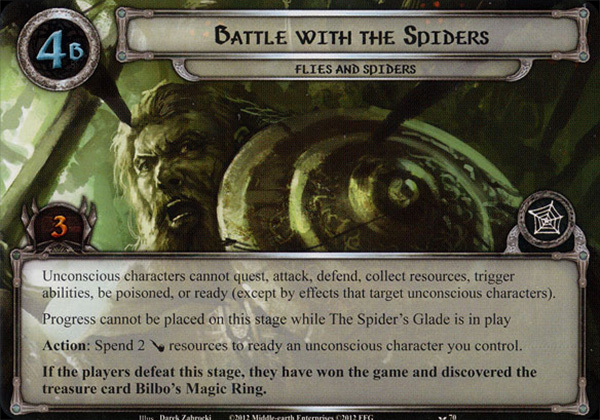 Search the encounter deck for The Spider's Glade and set it aside, out of play. Then, shuffle the encounter deck and reveal 1 encounter card per player. Unconscious characters cannot quest, attack, defend, collect resources, trigger abilities, be poisoned, or ready (except by effects that target unconscious character). When Revealed: Reveal stage 3 and create a separate staging area for the first player use that stage. If there are not other players in the game, discard this stage and each card in the staging area. All other players advance to stage 4. When Revealed: Remove all resources from each hero's resource pool. Then, make each character you control (except Bilbo Baggins) unconscious. Unconscious characters cannot quest, attack, defend, collect resources, trigger abilities, be poisoned, or ready (except by effects that target unconscious character). Do not pass the first player token. When this stage is complete, do not advance to stage 4 until the end of the quest phase. (Combine staging areas if necessary.) Action: Spend 2 Baggins resources to ready and unconscious character you control. 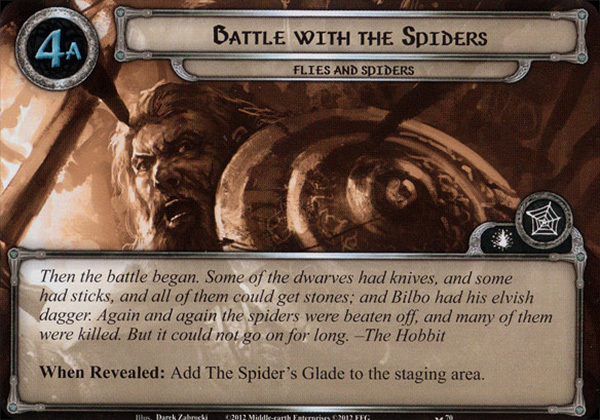 When Revealed: Add The Spider's Glade to the staging area. Unconscious characters cannot quest, attack, defend, collect resources, trigger abilities, be poisoned, or ready (except by effects that target unconscious character). Progress cannot be placed on this stage while The Spider's Glade is in play. Action: Spend 2 Baggins resources to ready an unconscious character you control. 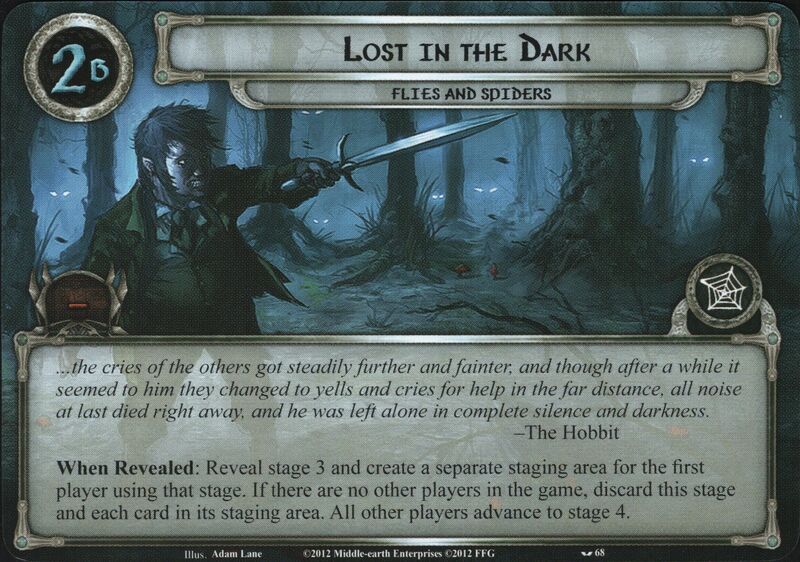 If the players defeat this stage, they have won the game and discovered the treasure card Bilbo's Magic Ring. 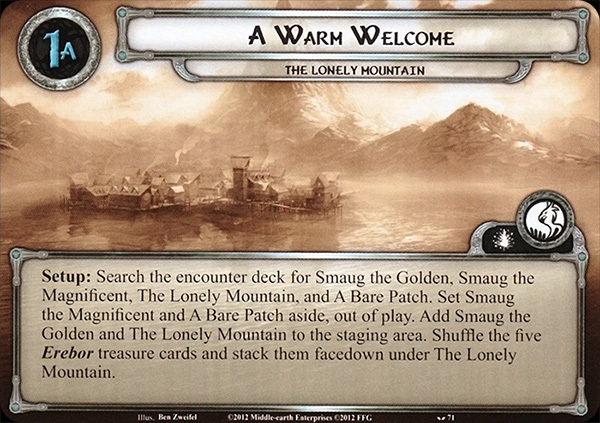 Setup: Search the encounter deck for Smaug the Golden, Smaug the Magnificent, The Lonely Mountain, and A Bare Patch. Set Smaug the Magnificent and A Bare Patch aside, out of play. Add Smaug the Golden and The Lonely Mountain to the staging area. 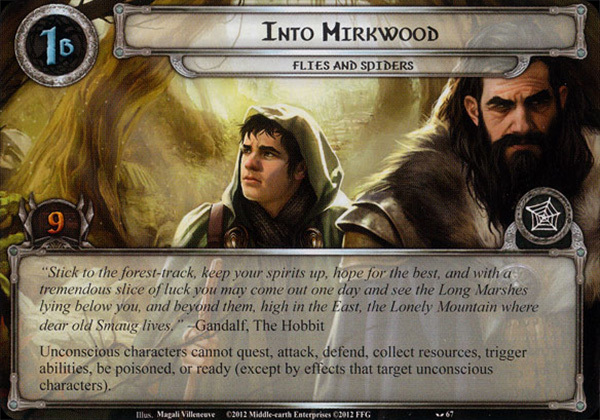 Shuffle the five Erebor treasure cards and stack them facedown under The Lonely Mountain. Skip the Quest phase. Forced: At the end of the round, advance to stage 2. Forced: After questing successfully, place 1 progress on Smaug the Golden. Then, he first player makes a burgle attempt. 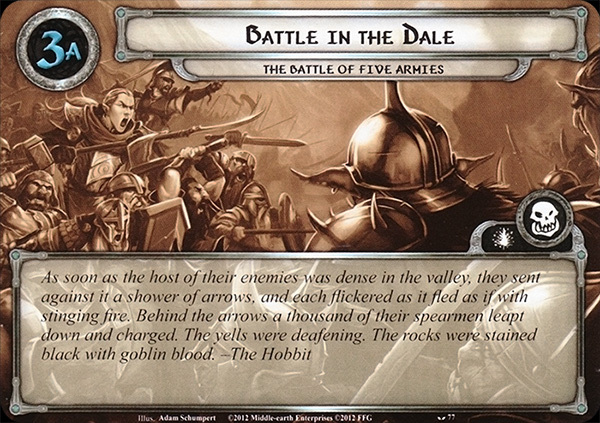 If successful, the first player takes the top card from under The Lonely Mountain into his hand. Then, the players may advance to stage 3. Forced: After the first player makes an unsuccessful burgle attempt, Smaug the Golden attacks the first player. 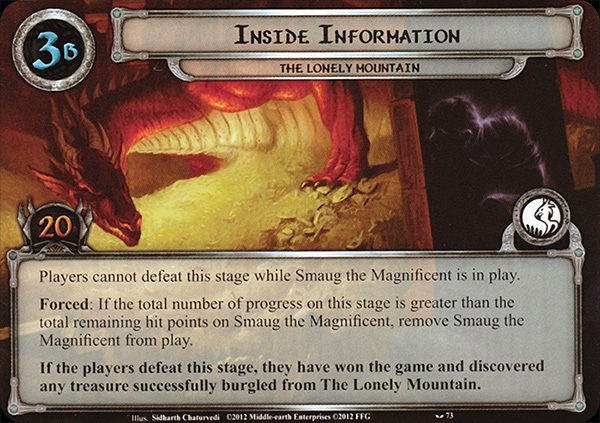 When Revealed: Set Smaug the Golden aside, out of play. Add Smaug the Magnificent and A Bare Patch to the staging area. Players cannot defeat this stage while Smaug the Magnificent is in play. Forced: If the total number of progress on this stage is greater than the total remaining hit points on Smaug the Magnificent, remove Smaug the Magnificent from play. If the players defeat this stage, they have won the game and discovered any treasure successfully burgled from The Lonely Mountain. When Revealed: Remove all progress from Smaug the Golden and set him aside, out of play. Then, add Smaug the Magnificent to the staging area. Forced: After placing the 7th progress token on this stage, remove all damage from Smaug the Magnificent and set him aside, out of play. 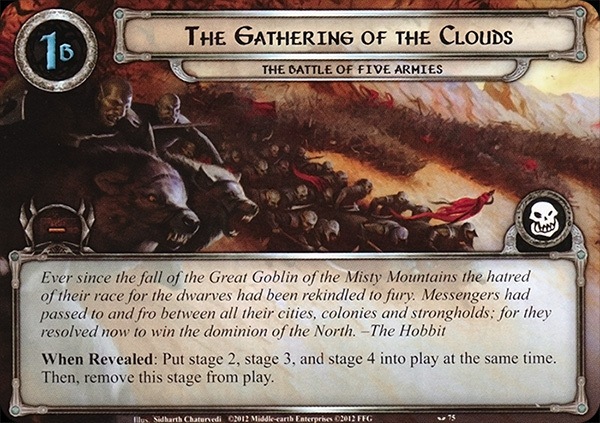 Then, add Smaug the Golden to the staging area and reset the quest deck to stage 2B. 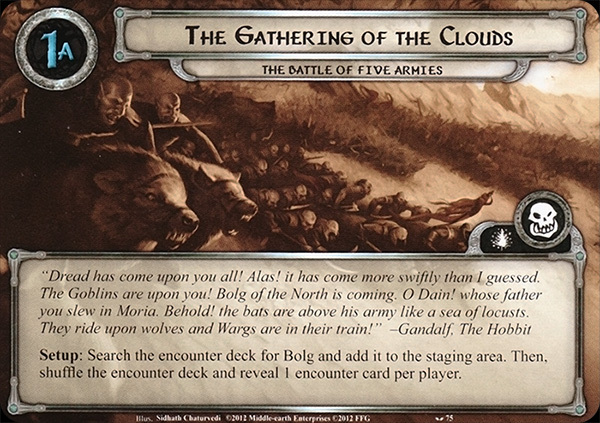 Setup: Search the encounter deck for Bolg and add it to the staging area. Then, shuffle the encounter deck and reveal 1 encounter card per player. When Revealed: Put stage 2, stage 3 and stage 4 into play at the same time. Then remove this stage from play. Players cannot advance from this stage unless stage 3 and stage 4 are complete. Forced: If there is no progress on this stage at the end of the round, each player must discard 1 random card from his hand. Players cannot advance from this stage unless stage 2 and stage 4 are complete. Forced: If there is no progress on this stage at the end of the round, the first player adds the topmost enemy in the discard pile to the staging area, if able. Players cannot advance from this stage unless stage 2 and stage 3 are complete. Forced: If there is no progress on this stage at the end of the round, each player must discard all resources from each hero's resource pool. When Revealed: Each player must search the encounter deck and discard pile for a copy of Bodyguard of Bolg and add it to the staging area, if able. Shuffle the encounter deck. Progress cannot be placed in this stage. While Bolg is in the staging area, it is considered to be engaged with the first player. 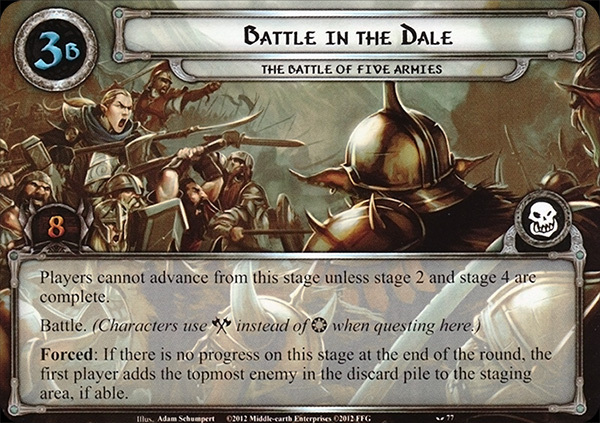 If Bolg is destroyed, the players win the game. While attached, Smaug the Magnificent gets -3 Defense.Response: After the players quest successfully, the first player makes a burgle attempt. If successful, attach A Bare Patch to Smaug the Magnificent. When Revealed: Each Dragon enemy in the staging area makes an immediate attack against the player with the highest total Willpower committed to the quest. (Do not deal a shadow card for this attack.) Burgle: The first player shuffles his deck and reveals the top card. He may discard 1 card from his hand that matches the revealed card's type and cost. Bolg cannot take damage. Forced: When this enemy attacks, deal it an additional shadow card for each quest stage in play with no progress tokens on it. Immune to player card effects. X is the number of players in the game.Cannot leave the staging area.The first Goblin revealed each round gains surge. When Revealed: Choose a hero to be removed from the quest and make that hero unconscious. If no hero was removed from the quest by this effect, this card gains surge. When Revealed: This enemy attacks the character with the most poison attached. Shadow: Defending character gets 1 poison. 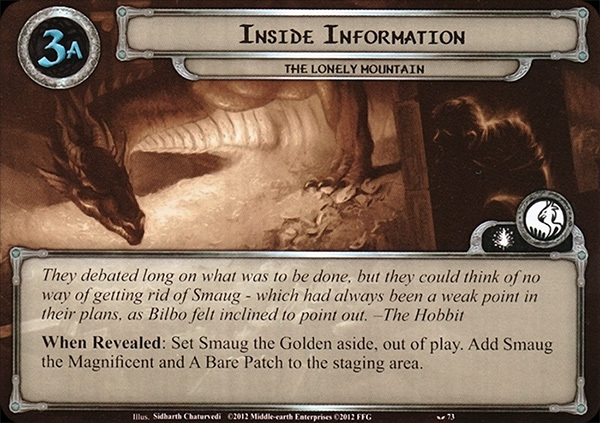 Forced: When a location is revealed from the encounter deck, put 1 progress on Smaug the Golden. Burgle: The first player shuffles his deck and reveals the top card. He may discard 1 card from his hand that matches the revealed card's sphere and type. Shadow: Attach this card to the defending character. 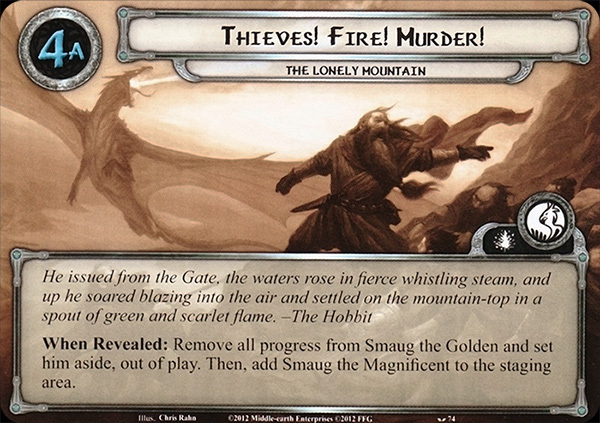 While Desolation of Smaug is the active location, the first treachery card revealed each round gains surge.Burgle: The first player shuffles his deck and reveals the top card. He may discard 2 cards from his hand that match the revealed card's cost. This enemy gets +3 Attack while engaged with a player who controls at least 1 poisoned character. When Revealed: The first player names a sphere. 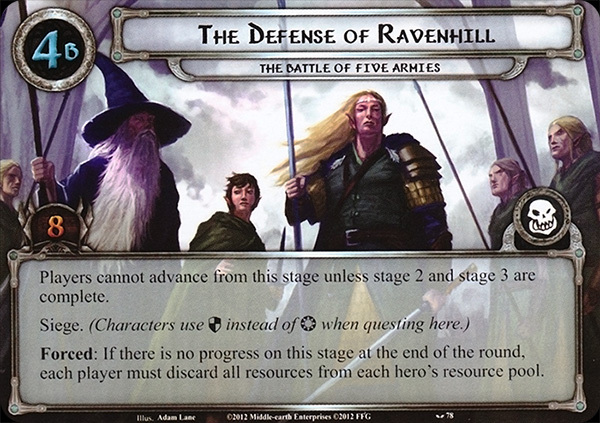 Then, all non-Baggins characters who do not belong to the named sphere are removed from the quest. While Forest Stream is the active location, poisoned characters cannot quest.Response: After Forest Stream leaves play as an explored location, discard 4 poison. 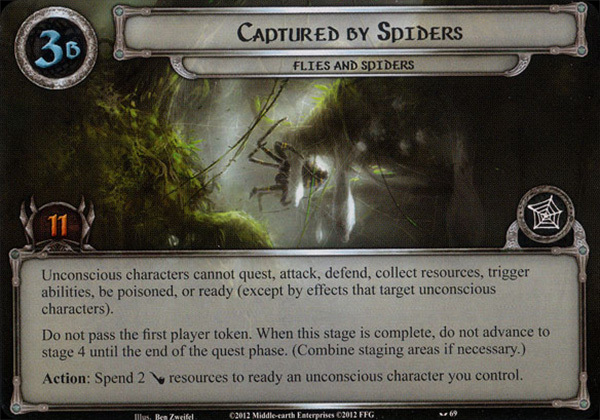 While Giant Web is the active location, each character gets -1 Willpower, -1 Attack, and -1 Defense for each poison it has.Response: After Giant Web leaves play as an explored location, ready an unconscious character. Shadow: Attacking enemy gets +1 Attack for each Goblin enemy engaged with you. While Great Hall is the active location, it gains: 'Forced: Put 1 progress on Smaug the Golden at the end of each round. 'Burgle: The first player shuffles his deck and reveals the top card. He may discard 3 cards from his hand that match the revealed card's type. Forced: When this enemy attacks, remove 1 progress from the current quest. Shadow: Attacking enemy gets +1 Attack for each quest stage in play with no progress on it. When Revealed: Each enemy engaged with a player makes an immediate attack. Do not deal shadow cards for attacks made by this effect. If no attacks were made by this effect, this card gains surge. Shadow: Attacking enemy makes an additional attack immediately after this one. When Revealed: Choose a different quest to be the current quest until the end of the round, if able. If the current quest did not change as a result of this effect, this card gains Doomed 3. While Hidden Path is the active location, locations in the staging area get -1 Threat.Travel: Spend 2 Baggins resources to travel here. When Revealed: Each player discards 2 random cards from hand. Until the end of the phase, each Dragon enemy in play gets +1 Threat for each event discarded by this effect.Burgle: The first player shuffles his deck and reveals the top card. He may discard 1 card from his hand that matches the revealed card's sphere and cost. When Revealed: Each character committed to the quest gets 1 poison. Shadow: If defending character is poisoned, make that character unconscious. 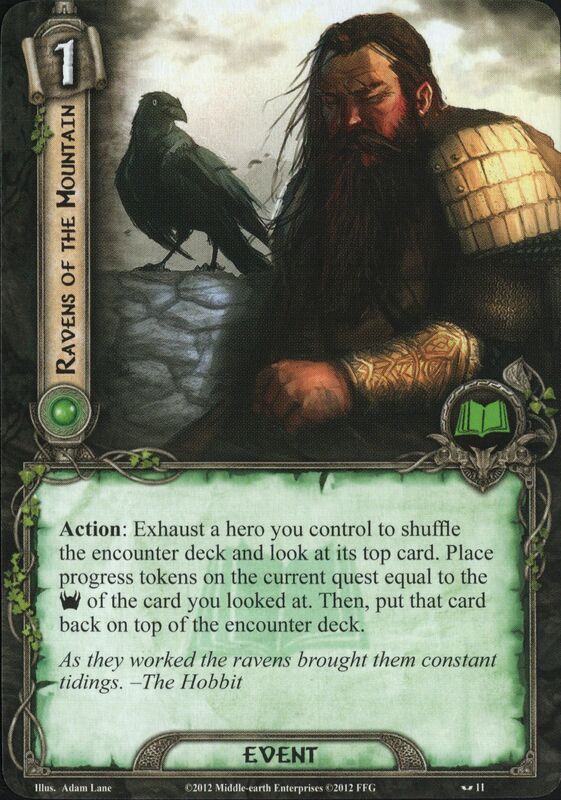 Action: The first player may spend 2 Baggins resources to (choose one): take control of Misty Mountain Eagle, or discard this ally to discard a non-unique enemy in the staging area. Shadow: Deal 3 damage to attacking enemy. Forced: At the end of each round, each player must give a hero he controls 1 poison. When Revealed: Each character takes damage equal to the number of poison it has. If no characters were damaged by this effect, this card gains surge. Shadow: Discard an unconscious character you control. When Revealed: Put 1 progress token on Smaug the Golden. Then, spend X Baggins resources or advance to stage 4A. 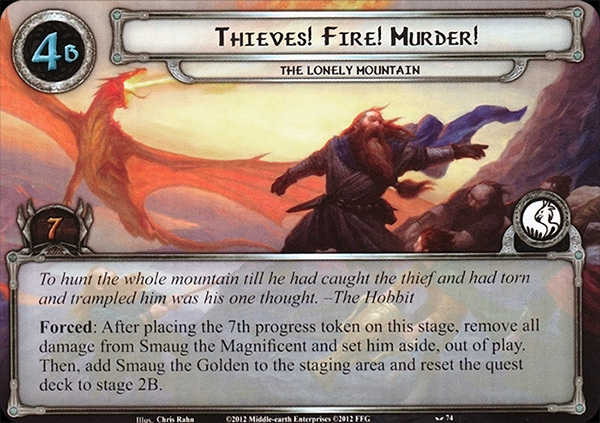 X is the number of progress tokens on Smaug the Golden.Burgle: The first player shuffles his deck and reveals the top card. He may discard 2 cards from his hand that match the revealed card's type. Shadow: Defending character gets -1 Defense for each quest stage in play with no progress on it. Immune to player card effects. Cannot be engaged. X is the number of non-Burglar characters committed to the quest. 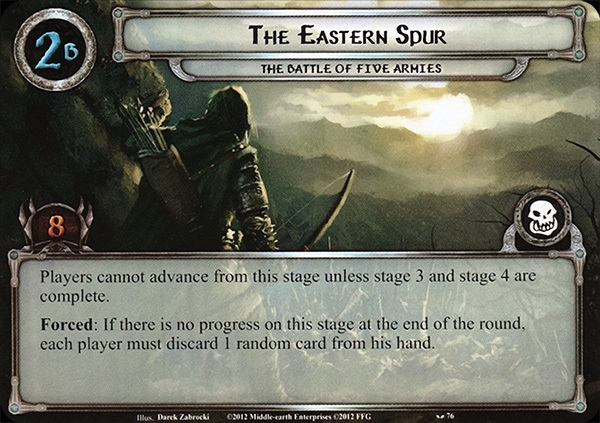 Forced: After the 6th progress token is placed here, the players advance to stage 4A. Immune to player card effects. Cannot leave the staging area (except by quest effect) but is considered to be engaged with the first player. Forced: If Smaug the Magnificent is dealt a shadow card with a burgle effect, he makes an additional attack immediately after this one. 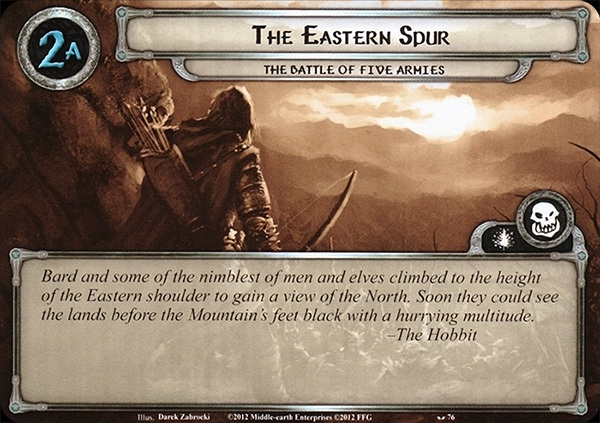 While at least 1 card is stacked underneath, The Lonely Mountain is immune to player card effects, cannot leave the staging area, and gets -2 Threat for each card stacked under it.Action: While making a burgle attempt, the first player may spend 2 Baggins resources to take the revealed card into hand and reveal the next card of his deck. Immune to player card effects. 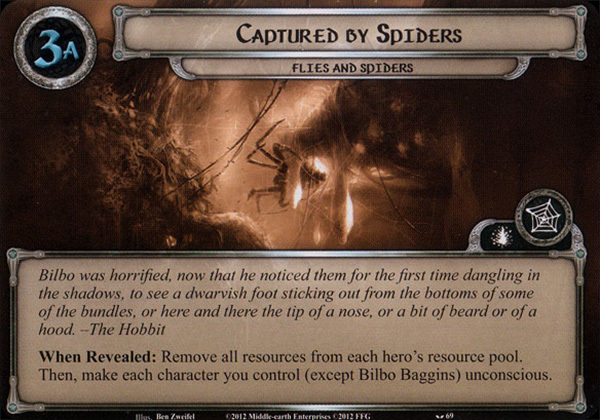 Travel: Exhaust Bilbo Baggins to travel here.Forced: At the start of each quest phase, search the encounter deck for 1 Spider enemy and add it to the staging area. (2 Spider enemies instead if 3 or more players are at this stage.) Shuffle the encounter deck. This enemy gets +1 Threat, +1 Attack, and +1 Defense for each quest stage in play with no progress on it. Shadow: If this attack destroys a character, remove all progress from the current quest. When Revealed: Until the end of the round, exhausted characters get -1 Willpower, -1 Attack, and -1 Defense. Shadow: If the defending character is destroyed by this attack, its controller must raise his threat by 5. Response: When Western Slopes leaves play as an explored location (choose one): the first player draws 2 cards, or remove 1 progress token from Smaug the Golden. Burgle: The first player shuffles his deck and reveals the top card. He may discard 2 cards from his hand that match the revealed card's sphere. Forced: When this enemy attacks, defending player must attach 1 poison to a character he controls. Shadow: Defending character gets 2 poison. When Revealed: Each player must deal 2 damage to a character he controls. Shadow: Deal 1 damage to defending character for each quest stage in play with no progress on it.